If you are an animal lover, and are saddened by the thought of someone gassing unwanted puppies/kittens (as tragically happens by the boatload each year) you can go pickup a few unwanted greyhounds, donate to the ASPCA or volunteer at a pet adoption service. But what about abandoned/neglected cars? If an old Alfa Romeo has one tire on a banana peel and another in the crusher, what can you do to help? There is no centralized agency to prevent cruelty to cars, so the next best thing is to buy it and fix it right. 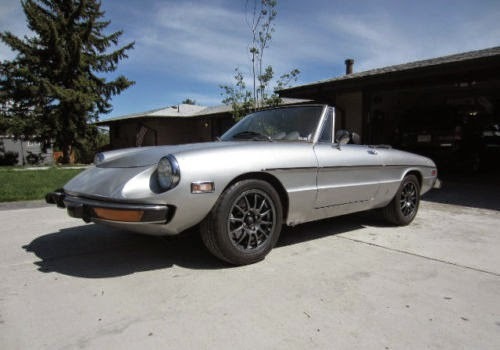 Find this 1973 Alfa Romeo Spider Series 2 offered for $5,500 buy-it-now on eBay, located in McKinney, TX with 2 days to go. At first glance it looks like this Spider might just need some cosmetic restoration. A damaged front upper valence and signs of rust bubbling through near jack points are immediately apparent in the low resolution pictures. 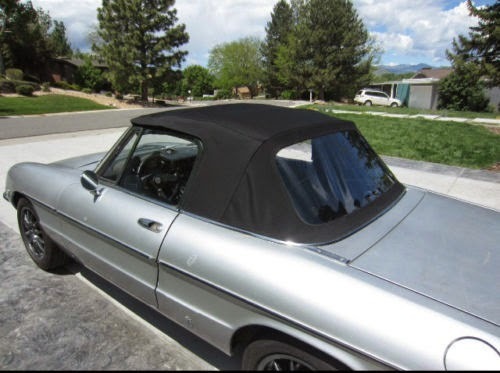 Reading the description adds little faith to the integrity of this open top, from the seller: Previous owner temporally fixed eroding floor pans with a thick aluminum plate reinforcement and undercoating. A solid fix, but if restoring, they will need attention. Yikes! Don't want to imply that ole Betsy is ready for the glue factory, but any improvised fix to rust repair on an old Alfa that involves undercoating as glue is temporary at best. Temporary insanity. It is a shame the body is in bad shape because this puppy still has a functioning set of SPICA (Eh Tony, you SPICA English to me or what?) 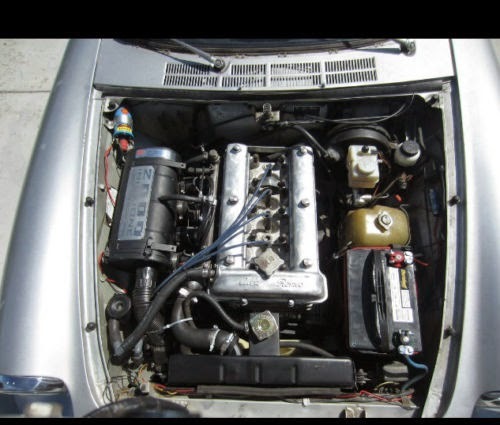 fuel injection equipment that the seller claims runs great. Compression is also good, but the transmission will need some attention because it has a grind, unless you double clutch it as described by the seller. Also, the thing leaks more fluid than a presidential campaign run by Edward Snowden. What in blazes is that? I'm no Alfa engineer, but they couldn't have put what looks like a curved bunk bed frame on the bottom of the car...could they? Is that a custom radiator guard/skid plate? 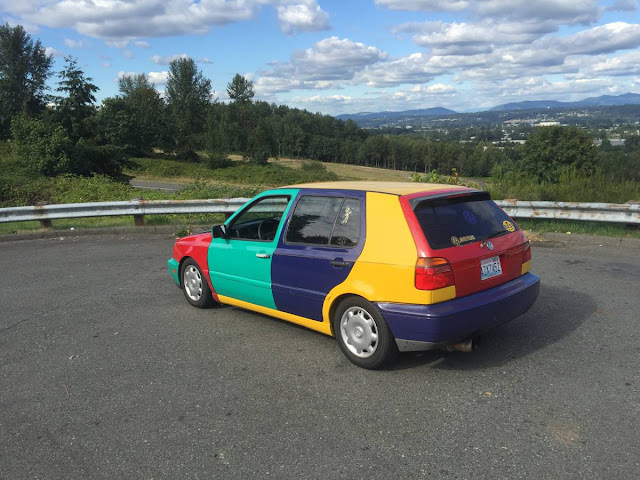 This car keeps getting weirder!! Hat tip to ledbull on oppositelock. I believe that these cars are like the Fiat 124s in that the oil pan sits slightly forward of the front tires so when you pull up to a concrete parking stop too vigorously, you risk denting the oil pan (and breaking off the oil pickup if you're really awesome). I did it twice in my 20 years of Fiat ownership. 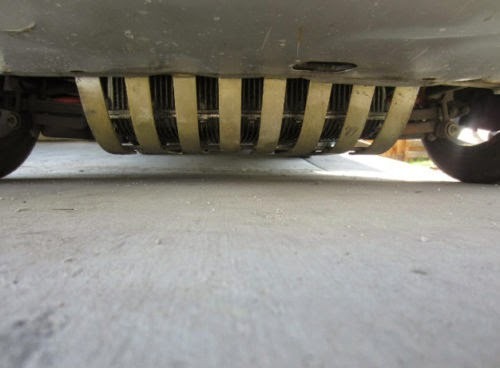 A couple of the mail order houses sell these oil pan guards to deter morons like me, and I think that's what we're seeing in that picture. The Alfa 4 has a huge, finned anvil-shaped aluminium oil pan for the 7 quarts of oil that it holds. In the US a few of them got damaged when owners drove over exposed manhole covers i.e. instant loss of oil and no va. Alfa US's fix was that giant cow catcher (you can still buy them in the aftermarket). Now instead of breaking the pan when you hit an exposed manhole cover, you break the motor mounts and jam the engine back in the car into the bulkhead. I like your analogy, but the problem is that at this car's asking price, this is the equivalent of paying $2500 to adopt a mutt with worms and hip dysplasia. Either way, you're really testing the limits of car or animal love. There is an old story about the Alfa factory race team (Autodelta) at Sebring in the 70's with a GTAm. It was running Lucas FI instead of SPICA. Someone comes up to one of the mechanics in the pits and asks about the SPICA fuel injection. The mechanic replies "No SPICA, English." This version Alfa spider looks like it is trading all day from $5-10k. Why single this dog out when you can likely find one with very few if any problems for the same money?